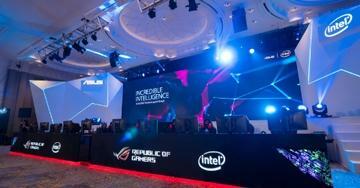 ASUS presented a new lineup of business, home and gaming innovations at the Incredible Intelligence 2018 Asia-Pacific region launch event recently held in Kuala Lumpur, Malaysia. Event highlights included the debut of the Zenbo Junior robot, ROG Maximus XI Apex motherboard and ROG Strix XG49VQ gaming monitor. "ASUS began with motherboards almost three decades ago, and now we are a multinational company with an expansive portfolio of incredible products that are consistently recognized by top-rated global organizations," said Jackie Hsu, ASUS Corporate Vice President and General Manager of Worldwide Sales for the Open Platform Business Group. ROG Maximus XI Apex is a premier motherboard with extreme overclocking capabilities, including enhanced Extreme Engine Digi+ with dual ProCool 8-pin power connectors and Overclocker&apos;s Toolkit, which offers a condensation detection circuit, Probelt and additional hardware-level controls. For professional content creators, the powerful duo of the Mini PC ProArt PA90 featuring the 9th Generation Intel® Core™ processor with support for Intel® Optane™ technology and the ProArt PA34VC monitor provides a capable and compelling platform for video editing, photography and computer-aided design (CAD). For business travelers and mobile creatives, ZenScreen Go MB16AP, the world&apos;s thinnest and lightest Full HD USB monitor, provides extra screen space for working or giving presentations while on the go. For networking, the RT-AX88U and AiMesh AX6100 Wi-Fi System offer the finest in ASUS networking technology, and each is designed for next-generation Wi-Fi 6 (802.11ax) for ultrafast and stable wireless connections.